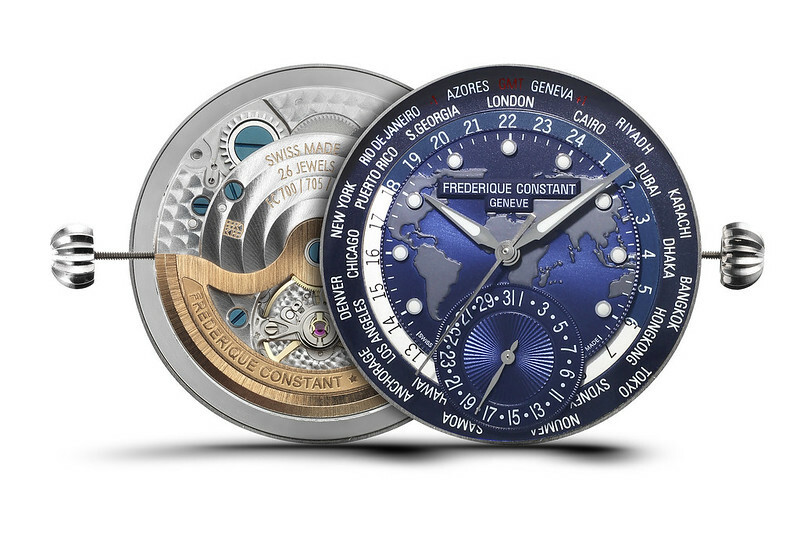 Swiss watch Manufacturer Frederique Constant known for its classical and refined timepieces at sensible prices pushed the boundaries with its new Worldtimer Manufacture. As the Worldtimer Manufacture continues to be one of Frederique Constant most successful collection, our passionate designers had the will to create a new version of this spectacular timepiece. 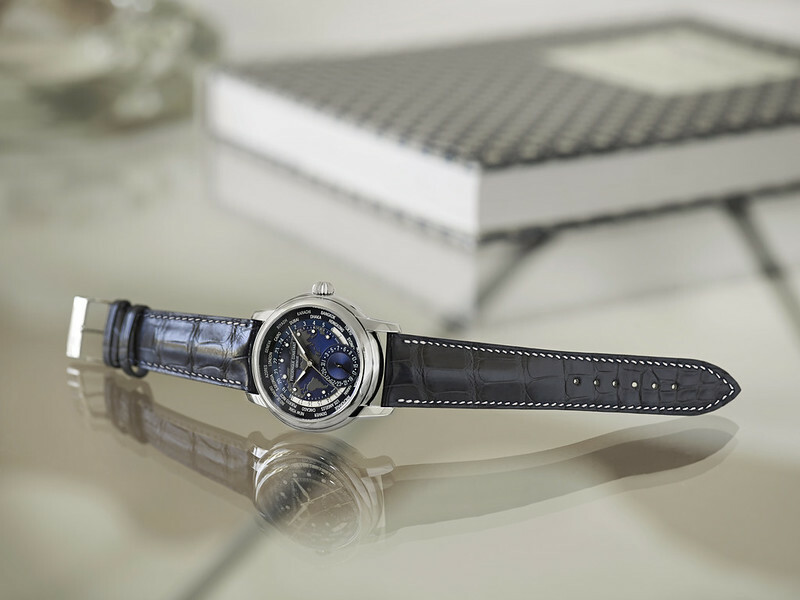 After months of hard work we are delighted to present you the new Worldtimer Navy Blue. This new watch is the perfect symbiosis between finest watchmaking technology and esthetic design. Our designer created this elegant timepiece for gentlemen that travel a lot, who are looking for a sophisticated and refined timepiece delightfully comfortable on the wrist. Not only, this watch will match perfectly with your suit but it will become the perfect and essential accessory of all your business trips. This model is driven by the FC-718 Manufacture automatic caliber , with 26 jewels and a 42-hour power reserve, is completely developed in-house at our manufacture in Plan-les-Ouates in Geneva. The technological genius of this timepiece is that all functions are easily accessible through the crown, there are no extra push buttons sticking out on the sides of the case. Simple to use, the Worldtimer function can be used by selecting the desired city and placing it at the 12’oclock position on the dial. Once the internal discs are synchronized, you will know what time it is in the biggest cities of the world. Furthermore, these discs also indicate if it’s the day, with the white disc or if it’s the night, with the blue disc. You can also read the date on the 6’oclock counter. 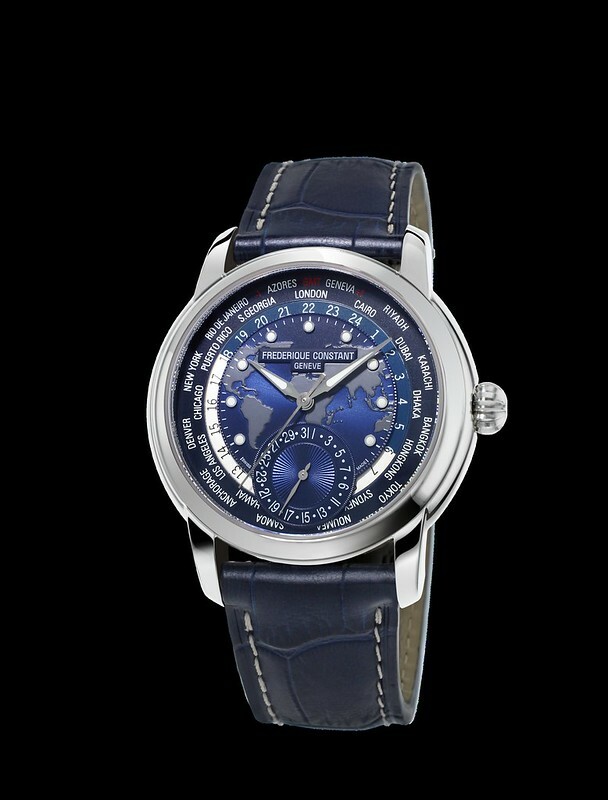 What makes this Worldtimer Manufacture stand out, is its elegant blue navy dial and its incredibly detailed anthracite grey world map in its center. The hour and minute hands are silver with a hint of a luminous white on it. This model is presented with highly-polished, three part stainless steel case, convex sapphire crystal, a see-through case back and is water resistant to 50 meters beneath the sea. This magnificent timepiece is finished with a unique blue alligator bracelet and is presented in a luxurious wooden gift box. Lovely colour combination. FC is really stepping up the game!! !